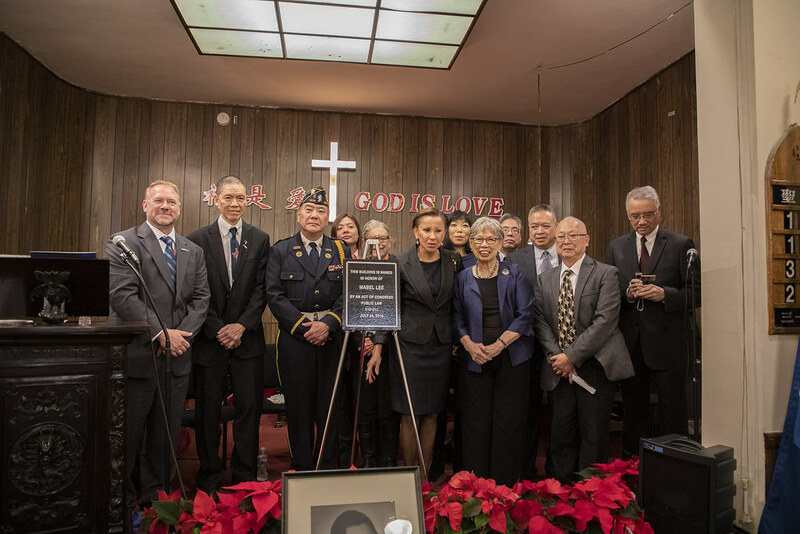 In a ceremony honoring Dr. Mabel Lee ’1916, the United States Postal Service dedicated Manhattan’s Chinatown Post Office on December 3 in New York City. This post office, located at 6 Doyers Street, is now named the Mabel Lee Memorial Post Office. Legislation that led to this historic designation was introduced in the House of Representatives by U.S. Representative Nydia Velázquez of New York’s 7th District and was signed into law by the president. Mabel Ping-Hua Lee was a Chinese-American advocate for women's suffrage in the United States, a member of the Women's Political Equality League, and the head of the First Chinese Baptist Church in New York's Chinatown—the location of the dedication ceremony—for more than 40 years. Lee was born in Guangzhou (Canton) in 1896 and settled in New York City with her family by 1905. As a teenager, she began advocating for women’s suffrage and became a well-known figure within the movement. In 1912, when Lee was 16, she played a pivotal role in the historic New York City parade for women’s suffrage. Ten thousand people attended the parade; Lee, on horseback, helped lead it. Lee attended Barnard College, where she was a member of the Debating Club and championed women’s rights in student publications. In 1921, she became the first Chinese-American woman to earn a Ph.D. in economics from Columbia University. Her dissertation was published as the book The Economic History of China. In 1917, women won the right to vote in New York State. In 1920, the Nineteenth Amendment gave women throughout the country the right to vote. However, not all women were able to exercise this constitutional right. Because of the Chinese Exclusion Act, which limited Chinese immigration and prevented Chinese immigrants from becoming citizens, Chinese-American women could not vote until 1943. Thus, Lee advocated for women’s right to vote even though she, along with other Chinese-American women, was unable to benefit. The daughter of a Baptist minister, Lee also devoted herself to strengthening the First Chinese Baptist Church of New York City, located at 21 Pell Street in Manhattan. In 1924, after her father died, she took over as director of the church. She later founded the Chinese Christian Center, a community center that offered vocational and English classes, a health clinic, and a kindergarten. Mabel Lee, who died in 1966, left an extraordinary legacy. The First Chinese Baptist Church continues the work she started—offering support, mentorship, and community programs for the community and beyond—helping everyone achieve the civil rights Lee fought so hard for.